The AIM NetworkNews and PoliticsThe Neo-liberal Juggernaut Rolls On. The Neo-liberal Juggernaut Rolls On. Election sloganeering becomes a cottage industry at election time. How well we remember, moving forward, who do you trust, go for growth, hope reward opportunity, a new way, stop the boats, real solutions and on it goes. If you like them, hang on to your hats because in the coming months there will be more. But if you are looking for substance you need to go behind the slogans to find the policy detail, if you still believe policies will be implemented as promised. The current government has so trashed the concept of honesty in its promises that we must cast doubt on their intention to deliver. After boasting that the adults were back in charge, we have witnessed a deterioration in employment, in education, in health, in childcare. We have witnessed increases in debt and in deficit spending, the two areas where the Coalition claimed they could improve upon immediately. Their only claim to fame is stopping the boats and even that is not true. The boats keep coming but get turned back. What a pathetic act of bullying. Sending our Navy out to stop a boatload of defenceless asylum seekers and claiming victory over the smugglers who traffic them. Additionally, they want to continue to imprison those that did arrive, along with the children subsequently born to them, as a message to the people smugglers who they have paid to turn back their boats. Domestically, they have failed to produce one policy initiative that directly improves the lives of the average Australian. Every proposal they consider seriously and float across the electorate, is targeted to impact negatively at the lower end of the income scale. They have spent months targeting an increase in the GST but have now dumped it for fear of an electoral backlash. On managing the economy, they deserve to be dumped, lock, stock and barrel into the middle of the Timor Sea. They bluff, they bluster, but on every measurable scale, they have made things worse than they were in September, 2013. They have butchered a planned world’s best NBN and turned it into a second rate product. They are now hounding the disabled and the aged, intent on marginalising them as a social burden, while striving to secure tax cuts for the top income earners, the biggest donors to their party’s fund raising and to those who use what influence they have to support them. Their strategy is always to benefit the lives of the well off. It is extraordinary that Malcolm Turnbull who has a salary of over $500,000 and reported to have a net worth of $200 million, is leading a campaign trying to stop a low paid waiter from earning an extra $50 on a Sunday. Rather, they want to lower the company tax rate for companies that pay no tax. Comments coming from senior ministers trying to score a few cheap points on welfare, ignore the hurt they cause people with severe disabilities who, but for the meagre pension they receive and the unpaid assistance given by family members, would be dead. 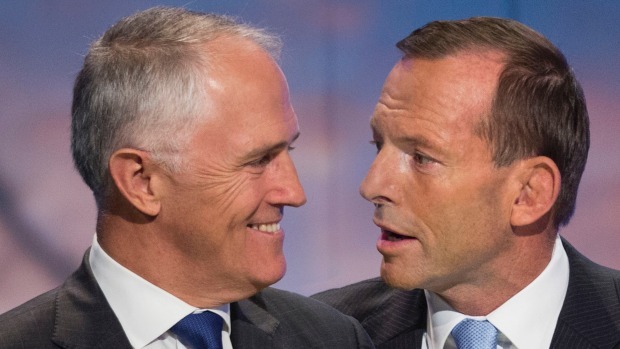 Latest polling figures from two sources suggest the gloss is coming off Malcolm Turnbull’s leadership. Let’s face it, he is the only thing the Coalition has got going for it and even he is now looking decidedly unsure of himself while the neo liberal juggernaut rolls on. Yet, 52% of voters plan to keep him there. As if adding insult to injury, the Australian Chamber of Commerce and Industry has released its pre-budget submission urging the government to curb spending. “If Australia waits until the system­ breaks, we will consign the next generation to painful re­adjustments similar to those taking place in southern Europe,” the submission says. What an unbelievably stupid comment! Who would write such rubbish? As a sovereign currency issuing nation, our “system” (whatever that means) can never break. Furthermore, to align our economy with that of southern Europe (presumably Greece and Spain), shows a staggering ignorance of the “system” within which the Eurozone operates. But it is the targeting of the tax reforms the ACCI has in its sights that really exposes the ruthlessness of its neo-liberal manifesto. “This year, $44 billion will be spent on the Age Pension. The chamber wants the government to consider converting pension payments to elderly homeowners into a loan that is repaid when the property is sold,” Anabel Hepworth writes in The Australian. So, to provide company tax cuts to companies that pay no tax, the ACCI wants to hit aged pensioners, childhood education and working parents of pre-school children. What a loving, caring chamber it must be. I wonder how many of its employees are imprisoned within its target recommendations. This is wh at the Coalition will be asking voters to endorse at the next election. Never mind the slogans, they will count for nothing. Look at the detail in their policies and you will discover the contempt for which they hold the average Australian. As for the 52% still keen to support them, one can understand the top 20% who will no doubt benefit from the Coalition being returned. The remaining 32% must be living in fantasyland. Here’s a thought to save significant monies if they profess to be still looking for same. Millions could be saved in fares and accommodation if backbenchers remained in their electoral offices during parliamentary sittings and used technology if their input is required. Questions without notice is a gross misnomer anyway and to have to lash out all that dosh on a bunch of nodders who ask the occasional Dorothy Dixer is criminal. Apart from cutting down on the racket during QT some of them may actually meet some of the people they are meant to represent. One of the big failings in measuring the 52% is that every single poll assumes preference flows from Sept 2013. That ain’t gonna happen the same way. Whilst the rusted on LNP vote sits around 40%, I think it is a complete falsehood to assume preference flows will be anything like what they were in 2013. This election is wide open. And the LNP are going to get flogged. I think Greens and ALP will pretty much soak up the swing vote, bringing death to the LNP. And I’m gonna work hard in my electorate to give Abbott the boot. The attempt to drag Greece in as a warning to Australia is such a Furphy …. also, Greece has a 23 percent or thereabouts VAT (the equivalent of the GST) …. not helping them very much at all …. Grand summary John Kelly …. I, like you, just do not understand why anyone who isn’t a multi-millionaire votes for the LNP ….. oh, yes, forgot about the fear and prejudice and greed factors ……. My sentiments precisely John Kelly and in answer to your question? Who would write such rubbish? Your photo says it all. That dimwitted little neo-con troll Carnell. So dull and so popular for pushing the anti Robin Hood exonomics theory. Great article,but why polute the Timor Sea? The remaining 32% are gullible moronic ignorant idiots. "What an unbelievably stupid comment! Who would write such rubbish?" That would be the former Chief Minister for Death and Destruction in Canberra. A real "loss" to Australia when she refused to nominate for Federal pre-selection in a safe Liberal seat. "loss" defined as …. thank Christ ! John Kelly, I am sure the admirable Kaye Lee and you will do the homework and show that even most of the top 20% get dudded by voting for these neo-con extremists. You need to factor in the “indirect” costs, that accrue because of their dismantling of the welfare fabric of the nation. I would estimate that the true beneficiaries are barely 1 or 2%. The rest are relatively well-off but fearful that their well-being will be “trashed by profligate govt. spending and intergenerational debt”, because they swallow the neo-liberal spin. If even a small fraction of these can be “enlightened” much will be achieved (in my view). “This year, $44 billion will be spent on the Age Pension. The chamber wants the government to consider converting pension payments to elderly homeowners into a loan that is repaid when the property is sold,” Anabel Hepworth writes in The Australian.” What would she like to do to the pensions of people who don’t own their home? I’m sure they are working on it. What else CAN you expect from “the Australian” and the ACCI? Would we expect the ACCI to be in favour of the better taxation of Corporations so that they actually pay the measly 30%? And how about the bonds from the miners? Once the miners walk away from the mines, the govt. is left to fill up the holes. The remediation bonds are inadequate. Just like James Hardie’s compensation for asbestos victims. These people really have no shame. As with the buccaneers and privateers of days past, Wall Street’s major players find it more profitable to expropriate the wealth of others than to find honest jobs producing goods and services beneficial to their communities. Come on moderator. What is wrong with my comment? It was the same rubbish you’ve posted 1,000 times before and it was just another comment aimed at deflecting the article onto something you – and only you – want to talk about. (Moderator). I was responding to the rubbish you people post and i was correcting your dishonest comments. Unemployment has not changed since the Coalition was elected. It is still at 5.8%. The budget deficit has not changed. It is still around $40B which is what Swan did. Nothing has changed since the Coalition was elected. NoS, by your own words that is a sad indictment of a government that promised so much and done so little. As you say, ‘nothing has changed’. Except that you overlook the debt. That certainly has changed. Also unemployment has changed. The government created 300,000 new jobs in 2013 yet more people are unemployed now than there were in 2013. That means they have failed to keep up with growth, as small as that has been. The unemployment rate in September 2013 was 5.7% with 697.000 out of work. The December 2016 figures are 5.8% and 727,000. That means they needed to create another 30,000 jobs just to keep pace with growth. They haven’t even done that, let alone actually begin to decrease unemployment. Most people would say there is no difference between 5.7% and 5.8% unemployment. And the budget deficit is about the same. No economic number has deteriorated. NoS, that is still a long way from what they promised. Swan made that comment on his budget night speech when he had access to all the information.and it never happened. How many times did Swan promise to run a surplus budget? Perhaps Hockey should have kept his mouth shut then, Neil. But what else was he going to say? The opposition had been critical of the government for not running a surplus, so naturally Hockey would promise one. It’s called ‘politics’. Have you forgotten the global financial crisis during Swan’s ministership? Perhaps, it is easy to dismiss the GFC because Swan’s spending helped stimulate our economy and Australians never had to face the mortgage foreclosures and loss of jobs and austerity measures that occurred in the rest of the world. So this fairytale surplus continues to be a catch cry of you LNP supporters. The most insidious aspect of the hokey/tiny ‘pre-election’ sloganeering, IMO, was their blatant lying. My memory is that they were in ‘lock step’ with the then government on Gonski, NDIS, Medicare, ABC, etc. The only policy differences were the carbon price, the mining tax, the boats and the NBN. On their election, they released a manifesto contrary to all of their undertakings. They have screamed blue murder about an obstructionist senate without ever acknowledging their own complicity by their own duplicity. We now have revolving door ministries, the occupation of which seems more reliant on the occupants ability to ‘spin’ than deal with those silly little things called policies. Swan made his 4 years of surpluses promise on budget night May 2012. The GFC was over by then. And since the GFC is over why isn’t the budget back in surplus? Low blow there. The point i was trying to make is that the unemployment rate is an inexact measurement. It is not that accurate. There is no difference between 5.7 and 5.8% unemployment. The picture at the top of the page says it all: They are one and the same person, a two headed monster having a conversation between themselves with no real concern for the rest of us. Neil, so Swan made his promise to return to a surplus long after GFC was over, and you have a problem with that. Why then do you not have a problem with the Liberals making the same promise and not delivering? I’m going to tell you something that may come as a bit of a shock to you. You may need to sit down first, as I don’t want you falling over and hurting yourself. Here goes: the Coalition is in government. The debt is skyrocketing. It can only be the government’s fault. You can try blaming Swan, Keating, HG Wells, Martians, Putin, Lawrence of Arabia, Mickey Mouse, Scrabble, Facebook, Kenya, Oodnadatta, me, John Kelly, stray cats, avocados, Andromeda, the Beatles, the CIA, Bigfoot, Fox Mulder, the ceiling in the Sistine Chappel, 007, WC Fields, Roy Rogers, Duck Dodgers of the 21st Century, Ford, BP, the Creature from the Black Lagoon, Klaatu, Plato a Tulpa or the dingo . . . it’s still the government’s fault. Now get it into your head. I don’t get the obsession with Surpluses. The government should not be retaining money like that unless there’s inflation issues to control. Surpluses are not savings they are theft. And deficits are not debt (technically they are debt in that the government guarantees you a dollar for every dollar you have), they are the government spending money into existence in the economy to create jobs and infrastructure. The government is the only entity legally able to create money, although the banks are also getting away with doing this, creating massive private debt which pressures governments to stop spending. Not only is there a class war between the top 10% (and their wannabes) but there is also a war going on between banks and government (public and private debt). Why then do you not have a problem with the Liberals making the same promise and not delivering? I answered that earlier. Opposition parties do not have the same access to economic numbers that people in govt do. Hockey was foolish to make a promise like that. Hockey has some responsibility but he is not as libel as Swan is. Swan made his 4 years of surplus promise in govt with the backing of Treasury behind him long after the GFC had ended. It looks like we will not have a surplus budget for the next 10 years. WE are about to see if MMT believers are right. DEbt does not matter since we have a soverign currency. Neil, you’ve missed my point (or skipped over it or conveniently ignored it). I don’t give a rats back what figures Hockey had at his disposal. He promised a surplus. Why aren’t you being critical of him for that? If he didn’t have the best info to hand then he was an idiot for making bold statements. And I don’t want a 10,000 word dissertation on how it was Labor’s fault. Just a simple yes or no. There’s no point, Michael, Neil just makes up figures. He’s a troll and if you say anything against the Liberal Party, he’ll just start arguing that Labor introduced the White Australia policy or led to the fall of Vietnam by withdrawing our troops. The man is either a paid worker for the Liberal Party or else he just stupid enough to do it for free. Why aren’t you being critical of him for that? If he didn’t have the best info to hand then he was an idiot for making bold statements. I have not got around to properly digesting the article above, but it would seem to me that the more the very rich get control over taxation policy to increase the divide, the more they allow to immigrate, and the more they ramp up terrorism fears, and gay fears the more they also benefit politically due to the authoritarian effect. The worse they are the more they create the circumstances for them to be re-elected, as some groups of people instinctually look for strongly authoritarian leaders who pretend they can cure all. Ie Oz had the GFC fear, so they elected strongman Abbott. Abbott extended upon Howard’s terrorism scaremongering playbook.